A small ship cruise on the modern American Spirit is for the traveler who pursues the exceptional. Uniquely designed to navigate the inland waterways of the magnificent East Coast and Alaska's Inside Passage, the American Spirit brings passengers to some of the most fascinating places in America. In the intimate atmosphere onboard, guests find that fellow travelers share their passion for these historic places, and often become fast friends. It's easy to relax and feel comfortable in the huge, public spaces onboard. Located on the second deck, our AAL staterooms offer nearly 240 square feet of space to create a spacious environment. 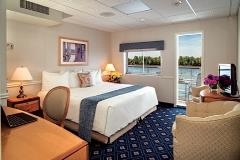 Suites are available with your choice of one King or two Twin sized beds and each stateroom features a private balcony. Enjoy the spacious accommodations of our AAC staterooms. Each room offers a choice between two Twin or one King sized bed and feature sliding glass doors that open up to your very own private balcony. Perfect for the solo traveler, our Single staterooms feature Twin sized beds, spacious bathrooms and a floor-to-ceiling sliding glass door that opens to your own private balcony. On our main deck are the A category staterooms. Featuring two Twin beds or one King sized bed, satellite TV, private bathrooms with full showers and large opening picture windows, these suites are comfortable getaways for discerning travelers. 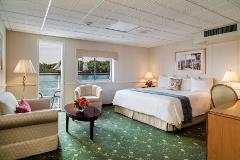 AA staterooms are located on the second deck and offers expansive views out of large opening picture windows. These suites allow for easy access to the Midship and Chesapeake lounge rooms and the dining area. American Cruise Line Staterooms are more than 200 square feet are are by far the largest in there Class. Many staterooms have a private balcony and all feature a roomy, private bath and a large, opening picture window, allowing you spectacular, up close views of Landscape, ports and sea. Enjoy a spacious stateroom to retire to with our 400 square foot Owner’s suite. Offering fine furnishings, a choice of two Twin or one King sized bed and intimate seating areas, these staterooms define modern luxury. Enjoy a sliding glass door that leads to your very own private balcony.